time-machine*2012 has no other items for sale. We now accept paypal & accept credit card payments through our merchant account. payment must be made within 4 days of end of auction. Had hopes of hitting something big and didn't . Did get good cards but stuff I already had . Also had a big concern over the wax card packs . Usually when you open a wax pack there is only one card that has a gum stain on it well mine had 2 and it had to been gone through . And the stain card was the first card on top and the last so I don't know .And I will be very carful for now on and take pictures of the packs and cards . These packs are not worth the price of what people are charging. People please understand your not going to find cards that make this worth your time if you like the thrill of a bet like a casino then by all means do it but if your spending money that should be spent elsewhere do not because you will not get cards worth half of what I pay for these. Some of these packs have already been gone through and resealed . Not saying this auction is that way just FYI this has happened and still does. 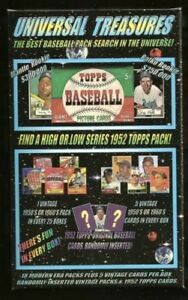 So buy these for fun and buy them to relive your childhood but don't expect to open a pack you buy and get a card worth 100 grand it's not going to happen! Most cards are junk and worth a few cents if that! I know what it says on the box but I was dissapointed. not only was it 80's and 90's which would be ok if you got a good rookie , but the 50's card together were not worth $12 total. I have bought 3 of these in the past and everytime most of the wax packs have been gone through already then resealed which is dissapointing and completlety messed up also most of the packs ate crap 80's and 90's and you never get good cards. Be aware when buying these universal treasures boxes in my opinion they are not worth the investment.